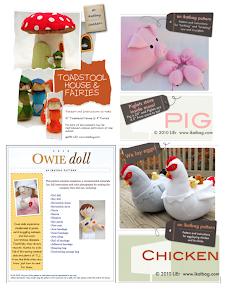 When Emily was researching food ideas for her Harry Potter party, she discovered a wealth of ideas and recipes on the internet. It seemed that for every Harry Potter edible, someone in the known universe had a go-to hack for it, with a fancy wrapper to boot. Hardly unexpected, given the heights to which the commercial merchandising of these novelty treats had already been elevated in theme parks, supermarkets and specialty candy stores all over the world. We were overwhelmed, let me tell you. Our challenge, therefore, was not so much finding things to make a party menu as it was leaving out about 95% of the side acts. Take Chocolate Frogs, for instance - try Googling them and you'll be spoiled for choice in merely the free printable boxes in which to package them. The boxes! Absolutely mind-blowing. Eventually, we narrowed our choices down to three: Chocolate Frogs, Cauldron Cakes and Every Flavour Beans. We also decided against any packaging - all the better to just eat the stuff, we thought. 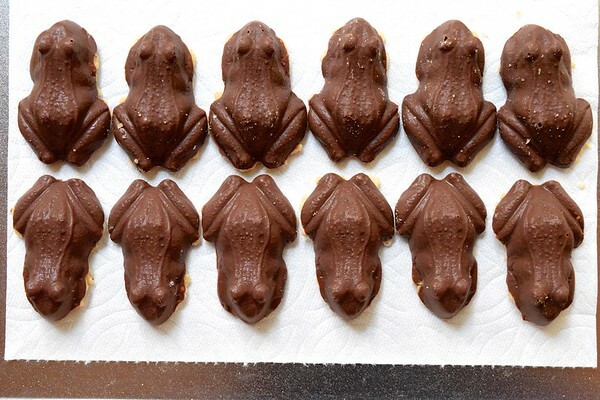 Neither Emily nor I have ever had an actual Chocolate Frog, but we'd heard it was plain frog-shaped chocolate, so she adapted a recipe from a youtube video and created her own version with peanut butter in the middle and crispy rice cereal on the bottom. Very tasty. We used this candy mold. Mix the peanut butter and powdered sugar in a small bowl. We didn't add all the sugar at once - its purpose was to turn the peanut butter into a kind of less-sticky dough so it could be worked with easily. Use as much powdered sugar as needed to allow you to comfortably roll the peanut butter into 5/8" balls. Spray the wells of the mold with cooking spray, then wipe clean and dry. Pour the melted chocolate into the mold, filling each well half-full. Tap gently to get rid of air bubbles. Roll each ball of peanut butter "dough" into a cylinder about 1" - 1 1/4" long and place in each well. Do not press it down to the bottom of the well - you want it to remain suspended in the middle of the Frog. Fill the well with more chocolate to cover the peanut butter, stopping about 1/8" to 1/4" from the top edge of the mold - you'll want some space allowance for the crispy rice. Again, tap gently to remove air bubbles. Press a layer of crispy rice into the surface of the chocolate. 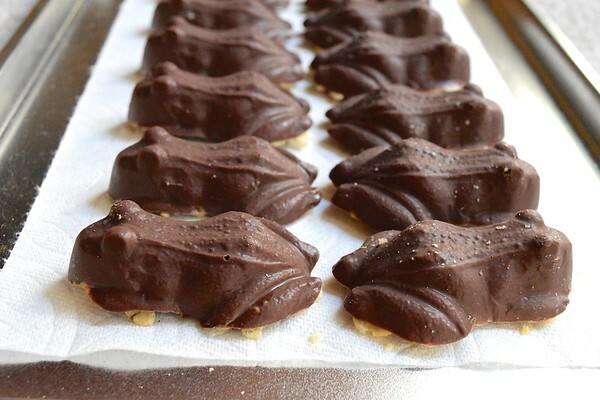 Let set (we had to set ours in the fridge), and then flip the mold over a tray or plate and pop out the Chocolate Frogs. Note: Emily says to warn you that the peanut butter dough is so good that people will eat on its own and you should be prepared to make more than you actually will use in the Frogs, because it is likely to disappear faster than you'd like, particularly if you have wee helpers in the kitchen. Again, lots of inspiration all over the internet, and it was a matter of picking our favorite combination of taste, ease of preparation and non-likelihood of wilting all over the tray in the late summer heat. Make the cupcakes according to the instructions on the box or your favorite recipe. 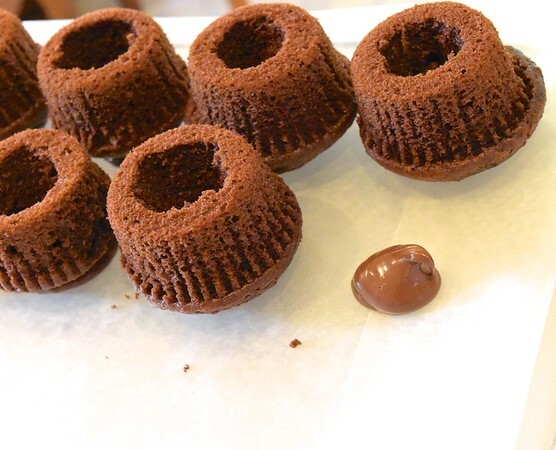 When cool, use a sharp knife to cut out a central conical cavity from the bottom of each cupcake, as shown in the photo below. Set cupcakes upside down to await filling. Mix the pudding with the cold milk in a medium bowl, using a whisk. Fold in 1/2 to 1 container of the whipped topping, to desired consistency. It should feel like thick pudding. Fill a piping bag with a large nozzle (about 1/2") or without a nozzle, cutting off the tip to make a 1/2" hole. Pipe the filling into the cavities in the upside-down cupcakes. Beat the cocoa into the butter. Add half of the cream/milk, the vanilla and the salt. Gradually beat in the sugar to taste, adding more cream/milk if necessary to the desired consistency. 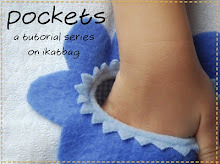 Scoop frosting into a piping bag with a small round or flat nozzle. Pipe a ring of frosting around cauldron for a rim, surrounding the filling. Pipe two small rings on the side of the cauldron for handles. Tragically, this is the only photo we have of the finished Cauldron Cakes. A big jar of Jelly Belly jelly beans from Costco, in a glass serving bowl. No bizarre flavours. No fancy single-serve boxes. Couldn't be simpler! While I appreciate the efforts that Jelly Belly went to in creating the official Botts beans, the flavors suggested by the books are....very accurate. And nauseating. And one off flavored one just taints the whole package. You took a wiser path. Thanks for sharing this party. 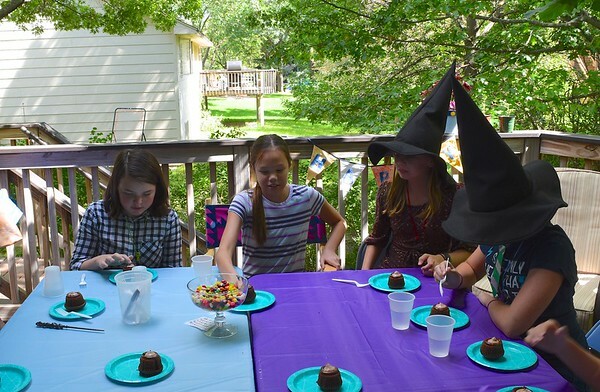 Many happy memories of our own friends/family Potter parties.